After a good night’s sleep the cavenauts and staff set of on day 2 of the extended exploration phase of the CAVES training course. Day 2 was an exploration day for the Cavenauts. 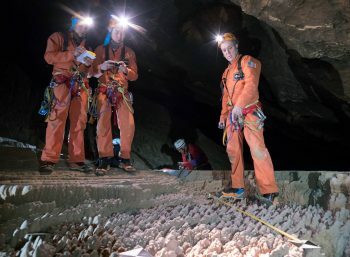 They moved ti the “4th wind” branch of the cave to run science and an additional photogrammetry run before reaching Baikal Lake, where the 2013 cavenaut crew had stopped its exploration. They crossed the underground lake to find a good location to setup Advanced Camp, which has be safe, comfortable, have water nearby and be assured of communication with the base campsite and a designated location outside the cave. Tests were performed throughout the day with two wireless devices: an xFERRA Radio and the Tedra system. They established connection at 16:30 using the TEDRA backup communication system, giving a GO for setting up advance camp on day 3. 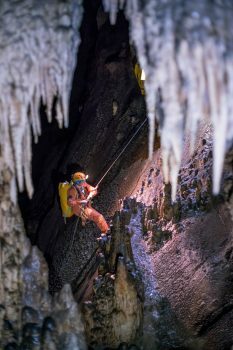 Temperature sensors were placed in predetermined locations, and the cavenauts searched for small cave animals but did not find any creatures. The crew and the staff team safely returned back to the Campsite around 19.30.